Habitat: Desert, Upland. It grows in grassy areas and in pastures. Description: The fuzzy, urn-shaped flowers have 5 ruffled lobes and are 4 inches (10 cm) long. 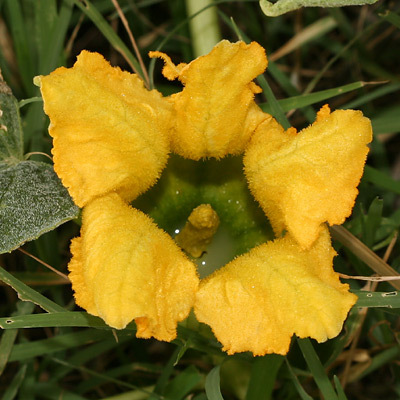 The female flowers are followed by light and dark green-striped gourds that dry to a solid tan color. 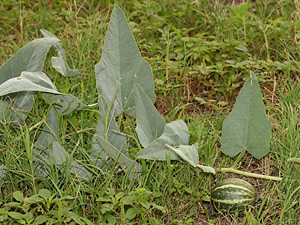 The leaves are large, silvery gray-green in color, and triangular to narrowly heart-shaped. The plants have a huge underground taproot. Edible – The seeds are edible like pumpkin seeds. The small, young fruits are supposedly also edible if cooked, but they are bitter. The taproots have been eaten in the past, but they are poisonous. Foul-smelling – The crushed leaves have a strong, foul smell like pungent human body odor mixed with sulfurous sewage. Some plants smell worse than others. Beware of treading on the foliage because it will make your shoes stink. Poisonous – The mature fruits and the taproots are poisonous. The horrible smelling foliage may be poisonous as well.